Picking up where they left off in Frederick, the Fayetteville Woodpeckers took the first of a four-game series against Myrtle Beach, 3-2 on Thursday night. For the third time in four games, Fayetteville was tied with their opponent heading into the ninth inning. The Woodpeckers have now won all three of those contests. The win is the fourth straight for the Woodpeckers as they move back into second place on the young standings in the Carolina League South Division with a 5-3 mark. 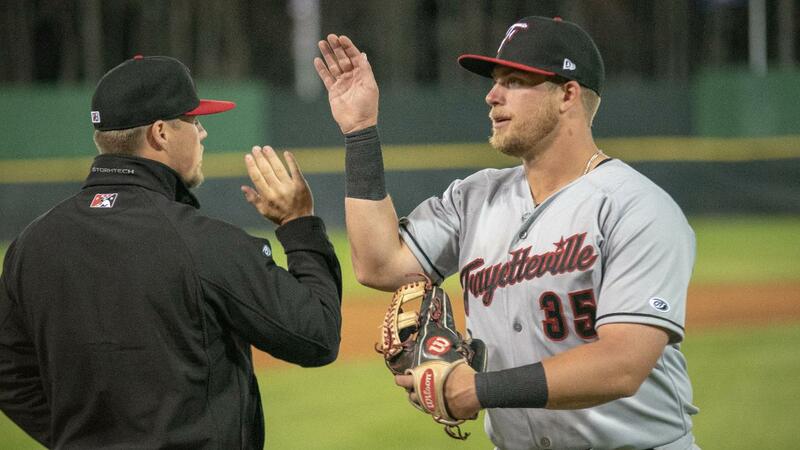 Jake Adams opened the night with a bang, smacking his second home run of the season, a two-run shot, into left-center field to put the Woodpeckers ahead in the first inning. After the homer, however, starting pitcher Bryan Hudson quieted the Woodpecker bats for the next four frames. Combining with two arms out of the bullpen, the Pelicans allowed only three baserunners total from the second inning through the eighth inning. As the offense went quiet, Fayetteville relied on a great start from Yohan Ramirez to maintain the lead. The right-hander tossed five scoreless innings against only two hits and two walks while striking out six Pelicans, leaving the game in line for a win. Ramirez would eventually take a no decision after Chad Donato surrendered a two-run home run in relief to Aramis Ademan in the seventh inning, tying the game at two. With the game tied heading to the ninth inning, Seth Beer led off the frame with a single to left field. After an out, Colton Shaver collected his second double of the day, splitting the gap in right-center to score the eventual winning run in Beer. The Pelicans came close to re-tying the game in the bottom of the ninth, but Donato was able to pick up a pair of strikeouts to earn the win.